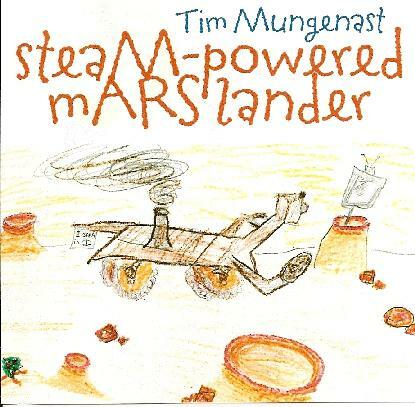 Tim Mungenast - "Steam-Powered Mars Lander"
About five or six years ago I reviewed a couple of Tim Mungenast's albums of quirky, psychedelic pop, so I was glad to see he had a new album out in the form of Steam-Powered Mars Lander. But my past experience had not entirely prepared me for the onslaught of improvised instrumental madness I was about to hear. To be fair though, Steam-Powered Mars Lander's music is not entirely unprecedented for Mungenast. His 2006 album, No Such Animal, which I unfortunately missed, was also an improvised set. The differences though, are a slightly different line-up of collaborating musicians, and the fact that No Such Animal featured much lengthier tracks (played by the entire band). Steam Powered Mars Lander focuses on shorter improvisations, each standing out with it's own unique characteristics. Some of the pieces feature just Mungenast himself, but on others he's joined by a variation of other musicians, including two former members of Boston experimental rock unit Cul-de-Sac, John Proudman and Michael Bloom. We get quite a few drone based, Eastern influenced pieces (indeed Mungenast plays electric sitar as well as guitar), but these are not at all like your traditional rock interpretations of Eastern music. Many tracks like Teahouse Noir, Bagpipes of Osmotic God, Brian May Does the Brown Acid and Launch are filled with angular, atonal noise experiments that emerge and soar through the drones. Mungenast's guitar playing is exquisitely exploratory but never descends into random chaos. There's purpose here, which makes these improvisations very focused in nature. Other tracks, like The Dragon Flies Glowed in the Dark and Prana are almost soundtrack-like in their atmospheres. And some are just plain out there, like the heavily ring-modulated Mungulator Ritual and the screeching The Scream. The music is generally a pretty challenging listen (in a good way). Only a few tracks, like the melodically inclined and rhythmic Fuzz Waltz and the rumbling Barrage á Trois (the only piece featuring drums) show any signs of the accessibility of the earlier albums. Mungenast remains uncompromising in his musical vision, and this makes for a very electrifying listening experience, worth taking the time to get into and discover its depth. For more information you can visit the Tim Mungenast web site at: http://www.timmungenast.com/.